This year’s Fall IDF in San Francisco provided the perfect opportunity for Intel folks from all over the world to meetup in one room, socialize, and relax with some of the people who cover their efforts, from traditional press to bloggers. 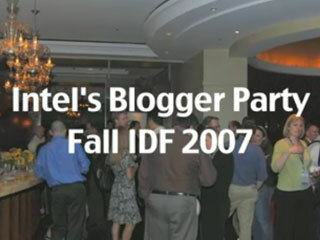 The attendees at this year’s “blogging event” included CEO Paul Otellini, Intel bloggers Josh Hilliker and Ylian Saint-Hilaire, Intel Vice President and General Manager of the Mobile Platforms Group Shmuel (Mooly) Eden, Intel spokesman and technology strategist Manny Vara, spokesman Bill Kirkus, Intel Senior Vice President and General Manager of the Digitial Home group Eric Kim, Intel Senior Vice President and General Manager of the Ultra Mobility Group Anand Chandrasekher, Intel Vice President and Director of the Digital Enterprise Group Operations Stephen L. Smith, and blogger Chris Heuer. The meetup took place at Ducca Restaurant, in downtown San Francisco.